The foreigner identification number (NIE) – is a fiscal document, which main purpose is a control of taxes and realization of any administrative actions on the territory of Spain. Every foreign citizen residing in the territory of Spain due to social, professional or economic reasons is given a special foreigner identification number,(Numero de Identidad de Extranjero) which serves as identification for all government institutions of Spain. The foreigner identification number (NIE) – is a fiscal document, which is used to control taxes and for any administrative processes pertaining to foreigners in the territory of Spain. It is important to understand that the NIE is not a residence permit nor does it give right to travel within the EU. NIE is a paper of the A4 size where private details of an individual (first and last names, date of birth, nationality) and a private number given to the foreigner by the Spanish government are indicated. In Spain NIE is issued by the Main Police Force. What is NIE necessary for? The foreigner identification number (NIE) gives its owner an opportunity to make big financial deals in Spain without a residence permit and it is also necessary for taxation purposes. You will be asked for this number if opening a bank account, starting new employment or opening your own business, as well as for purchasing real estate or a car. How to obtain NIE in Spain? 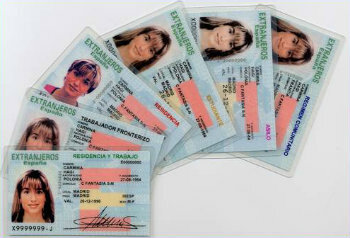 • An authorization allowing another person to turn in your papers into the appropriate Spanish government institution. - Originals and copies of documents which confirm your motives for the NIE application. For owners of real estate in Spain, it can be a letter from the notary indicating your intentions or a precontract for buying an apartment signed by the owner or a building company. After handing in the application the official certificate is issued (resguardo), which you need to present upon picking up your NIE. The time needed for issuing an NIE usually takes from 1 to 15 days. The NIE card can be picked up by any person who has an authorization for doing so, which can arranged for at the time of applying. When receiving your NIE, you will be given a tax ticket which can be paid at the nearest bank. The amount varies depending on the region of Spain and is around 10 euros. You can also apply for an NIE by visiting a Spanish Embassy. In this case you will be asked for two color pictures of passport size. All papers have to be presented at the embassy in person. The embassy itself does not issue an NIE, it works as a mediator who forwards your documents to an appropriate Spanish institution. If you plan to be away from Spain, you should be very careful indicating the sending address. Some embassies require a Spanish address while others also ask for the hometown address. If you authorize another person to hand in your documents, it is obligatory to issue an authorization at a notary. It can be done at any government notary in Spain or in a Spanish embassy abroad. In case of issuing the authorization abroad, it needs a legal translation and an apostil. This kind of juridical service in Spain costs around € 150-250. Prices vary according to lawyer bureaus.